Sometimes the best discoveries are the unexpected ones. 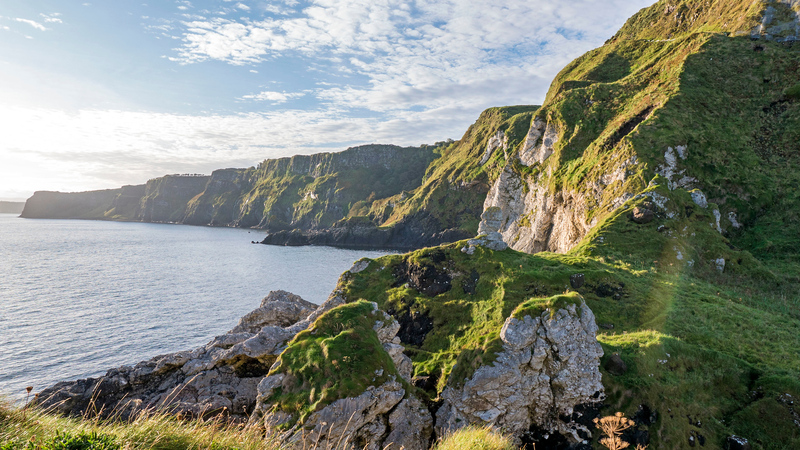 We departed Belfast bright and early one morning for a self-guided tour of the Causeway Coastal Route in Northern Ireland. 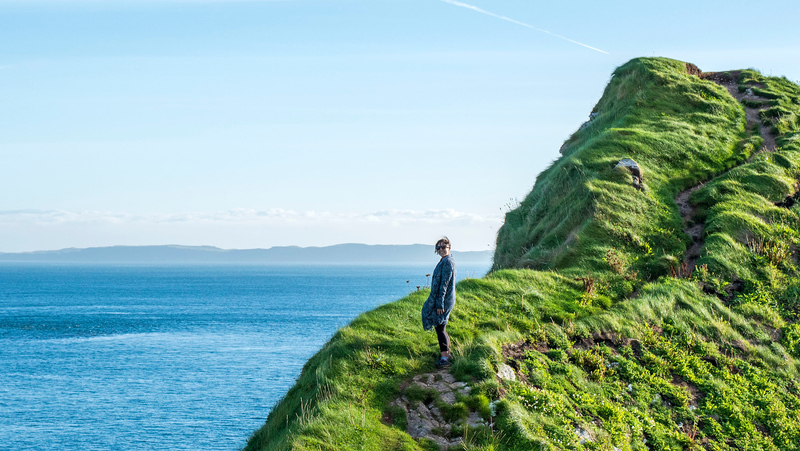 It’s one of the most scenic and magical road trips on the planet, although I’d argue that was the case for most of Ireland. 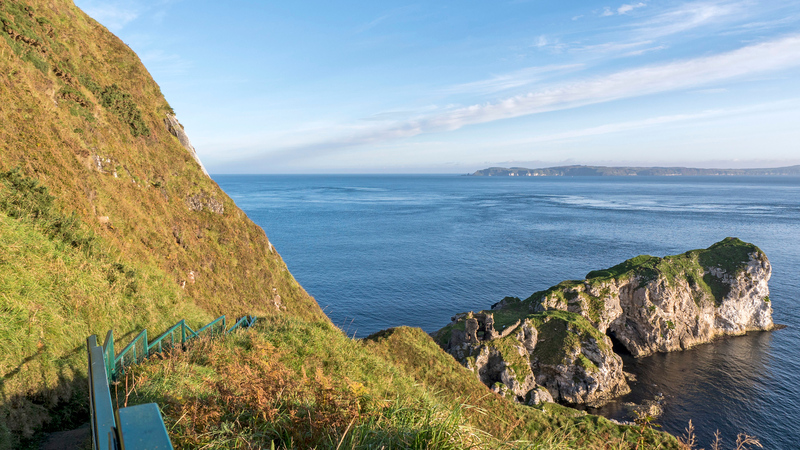 The Causeway Coastal Route runs along the coast of Northern Ireland, between Belfast and Derry. We managed to travel the whole thing in a day, although you should try to take a couple of days there to absorb your surroundings more slowly. As Ashley (my travel buddy for this trip to Ireland) and I ventured between the small town of Ballycastle and the Carrick-a-Rede Rope Bridge, we stumbled upon a random sign on the road. 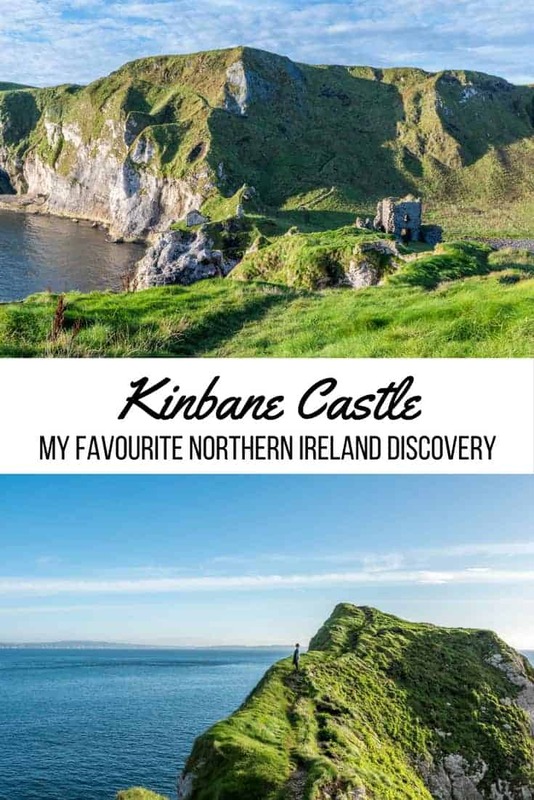 It simply read, “Kinbane Castle.” This castle wasn’t on our itinerary and we didn’t know anything about it. Even still, we thought it would be fun to veer off course to check it out. I’m so glad that we did. What’s your favourite random discovery while travelling? Do you have a favourite castle that you’ve visited? There’s a small parking lot at the end of a narrow, winding dirt road. There’s no way that giant tour buses can get down there. 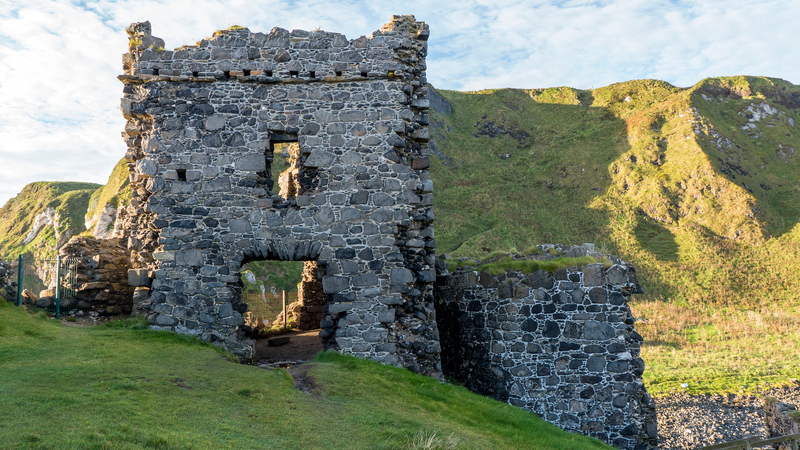 As we visited Kinbane Castle early in the morning, there was no one else in sight, except for the few people that were arriving as we were leaving. Even still, the site must welcome enough guests as there was a small building with bathroom facilities. Nonetheless, early in the morning, Kinbane Castle was completely ours. I sauntered down a slowly declining path, absorbing the stunning view all around. A staircase meandered down towards the narrow headland. The ruins of an ancient castle materialized as I gradually descended the cliffs. Not much of Kinbane Castle remains, although this didn’t make my discovery of the site any less magical. 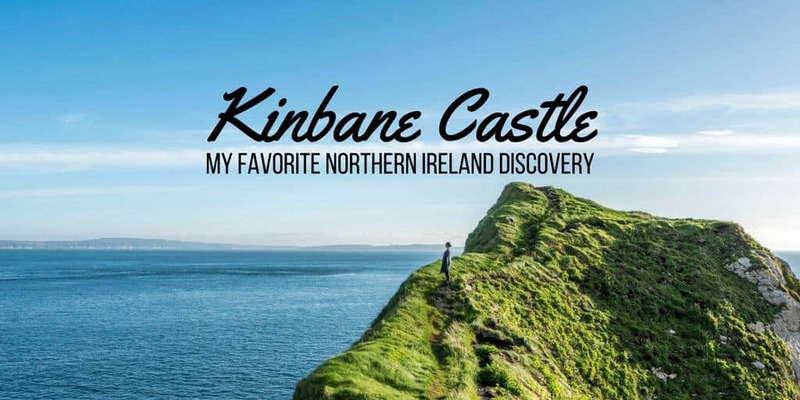 The word, “Kinbane” means “White Head” and it refers to the white limestone surrounding the castle. The scenery surrounding the castle was absolutely breathtaking. Kinbane Castle faces dramatic, jagged cliffs, and a deep, blue sea extends beyond it as far as I could see. Naturally, as in most of Ireland and Northern Ireland, everything was so green. Layers of moss and soft grasses covered nearly every surface. Don’t be like me and leave your hiking boots in the car. Without sturdy shoes, you’ll have a much more difficult time. Although there were some steps, most of the path towards and around Kinbane Castle was quite slippery and not well maintained. Take your time on this path as it’s quite a steep drop down below! Sadly, while this headland is absolutely beautiful, it has claimed many lives. Please proceed with caution. If the weather isn’t great or the path is closed, don’t even think about walking up there. Fortunately, it was a sunny and clear day when we visited with barely any clouds in the sky. Looking at the ruins of Kinbane Castle now, it’s hard to imagine what it once looked like back in its previous glory. 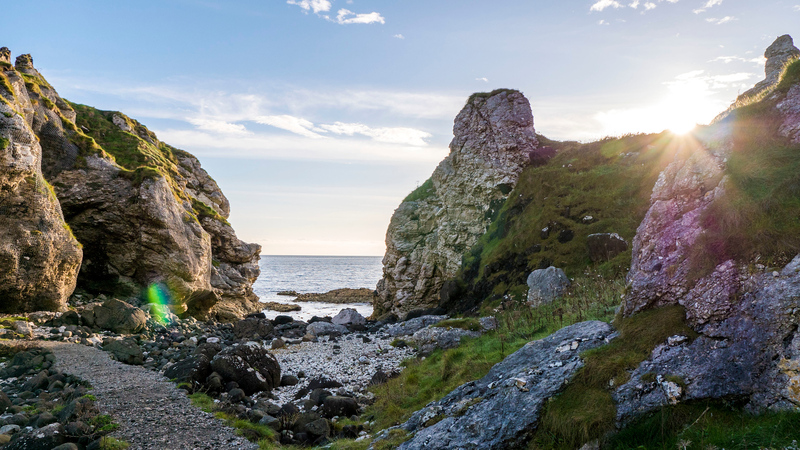 It was a two-storey castle built in 1547 by Colla MacDonnell, son of the Lord of Islay and Kintyre. It had a large courtyard, and even perhaps other smaller buildings around it. 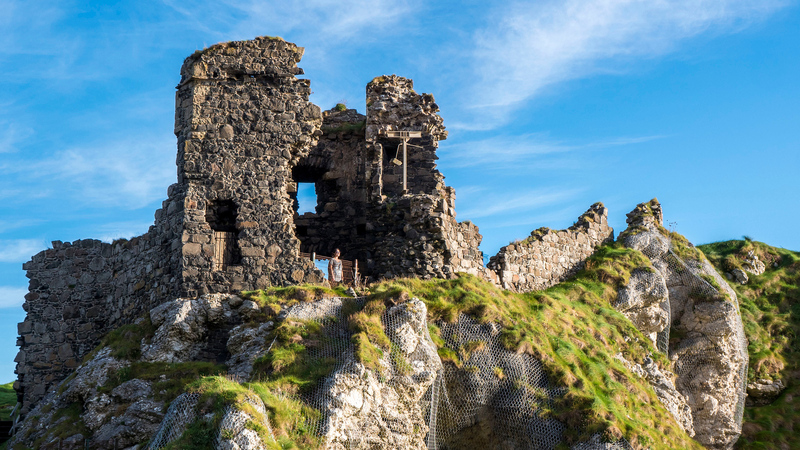 Kinbane Castle was besieged by British Forces in 1551 and 1555, where the castle was partially destroyed by cannon fire. Rebuilt soon afterwards, Colla MacDonnell passed away at the castle in 1558. During another attack in the 1500s, soldiers from Carrickfergus arrived to overtake the castle. They weren’t able to immediately gain access and waited below in the hollow between the cliffs and castle. Those within the castle lit a fire on the headland to call for assistance. As help arrived, the soldiers became trapped between the hollow, with cliffs on one side and the ocean on the other. The soldiers were all killed and the hollow became known as “Lag na Sassenach” (Hollow of the English). Even without any prior knowledge of the mass deaths and sieges when I first explored Kinbane Castle, this area certainly had a striking and even haunting atmosphere. 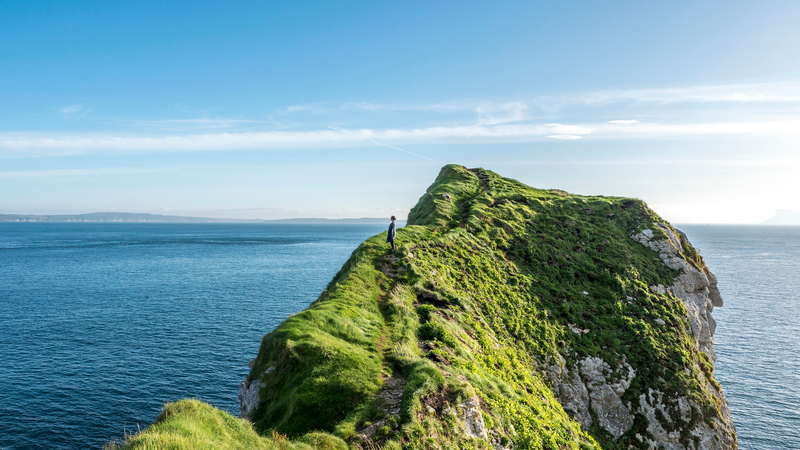 If you’re planning a road trip to Northern Ireland along the Causeway Coastal Route, definitely add a visit to Kinbane Castle. 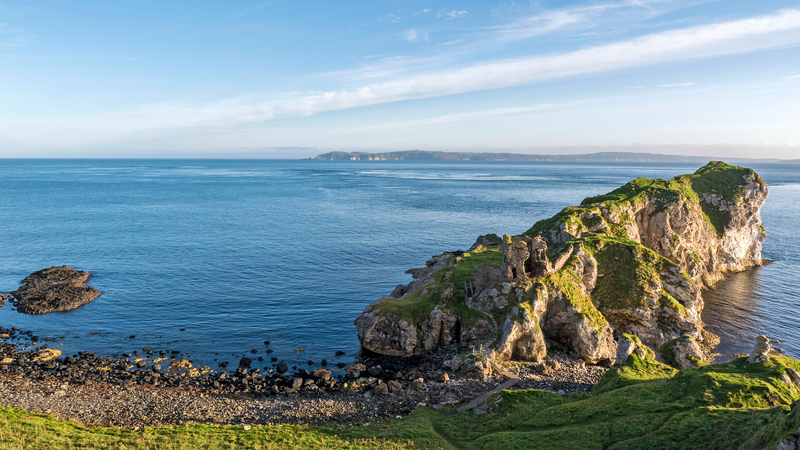 The castle ruins are isolated and magnificent, and the surrounding cliffs and limestone headland are astonishingly brilliant. You won’t be disappointed. If you’re looking for accommodations along the Causeway Coastal Route, I spent one night in Belfast and another night in Derry. In Belfast, I stayed at the Clayton Hotel Belfast. Feel free to check out my review, the reviews of others, and book your stay in Belfast. In Derry, I stayed at the Bridge Bed & Breakfast. Here’s my review, the reviews of others, and book your stay in Derry. 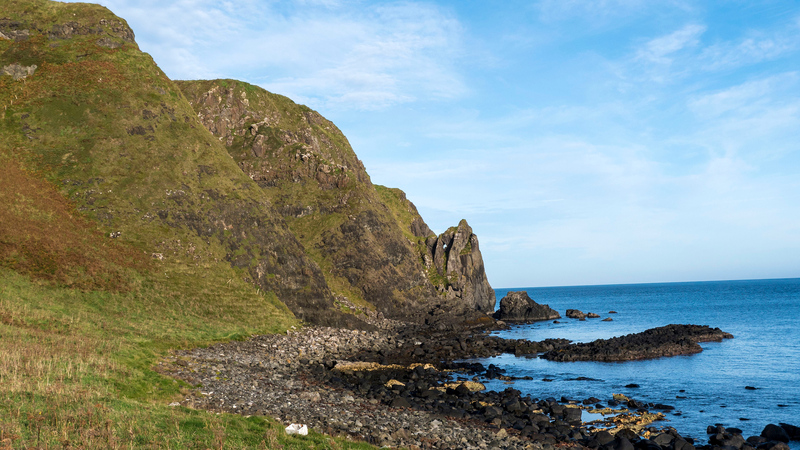 For more photos of the Causeway Coastal Route of Northern Ireland, please check out my travel photo album. And you’re right, it’s hard to imagine the huge building that the Kinbane Castle obviously once was. There’s not much to see regarding the remains. But look at the landscape! Love your photos, it really looks mesmerizing! I like the location of the castle more than the castle itself. It seems our ancestors knew how to choose the perfect places to build castles. Is it a difficult hike or can anyone with average fitness levels do it? What an awesome spontaneous addition to your road trip. How lucky to have caught sight of the sign! 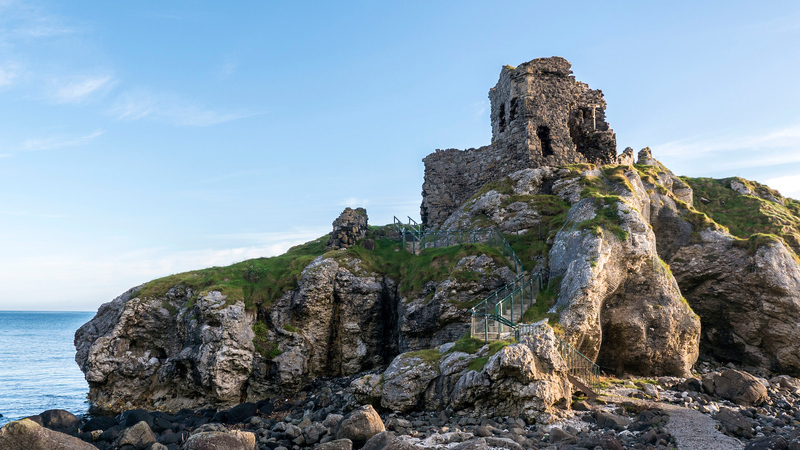 The ruins of an ancient castle on a cliff overlooking the sea sounds exactly what I expect Northern Ireland would be. And I love that it’s a very unassuming attraction – sitting there without pomp or pretence, authentic and left for the tourist who decides to veer off from the main road. Good note on sturdy shows though – it definitely gives off a haunting feel even before knowing the history. The headlands are absolutely stunning. Good find! Your photographs are absolutely stunning, Lauren! It looks like you had amazing weather. I love the shots of you standing out on the cliffs at the water – it really puts into scale/perspective how giant these formations are! I just love those beautiful blues and greens! I would just love to spend a day hiking here. 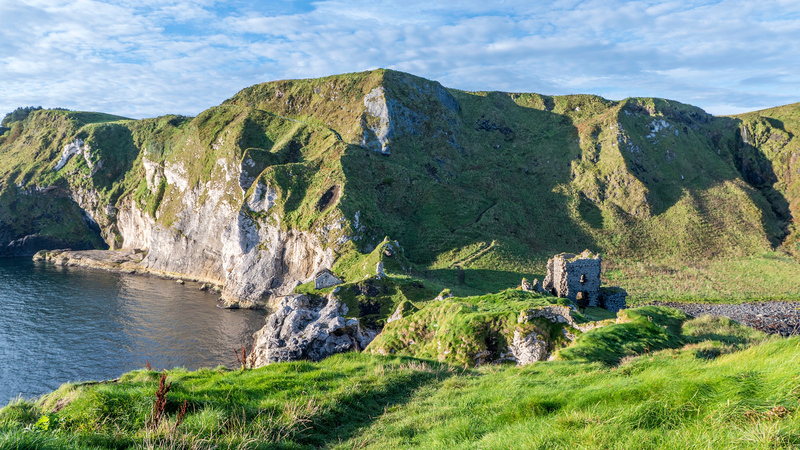 The Causeway Coastal Route is number one on my to do list for 2018, and I have looked at pictures of Kinbane Castle for so long. I find it fascinating, I love ruins and your pictures are just unbeliveably beautiful. I feel like you’ve captured the rugged coastline perfectly. Whoa, it looks amazing! In fact I think I might have seen some drop footage from there not long ago and my jaw totally dropped. So green!